World of Vattenfall is an interactive installation that shows point of interest all around Germany and Sweden where the company organizes sports and cultural events or uses winmill-powered plants to generate energy. The goal is to present the “other” side of the Vattenfall Group to the people and form the image of a caring and active company. 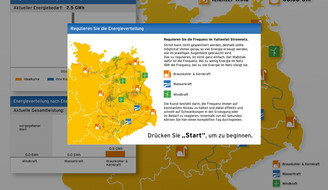 Based on a concept by Interbrand Zintzmeyer&Lux we designed an interactive application using “MMM”, the MESO Map Mover, together with aerial photos that the user can move around with his fingers, to create a simple to navigate interface while providing a nice aerial view of Vattenfall Group’s activities. Special buttons on the overview map open detail views of cities, where the visitor can explore the events in a detailed description. The system is part of an interactive installation at Vattenfall branch offices in Berlin and Hamburg. 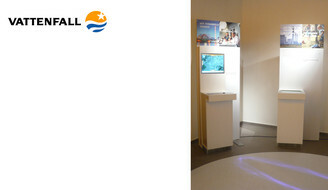 A small exhibition of interactive installations that provide informations about energy service provider Vattenfall Group in its German branch offices in Berlin and Hamburg.